Also visit the district website for the most up-to-date version of “This Week’s Good News” published through Interim Superintendent Robert Allen’s office. The Early College Alliance a public, early/middle college program located on the campus of Eastern Michigan University is hosting a public information session for interested students who will be entering 9th or 10th grade in fall 2011 and their parents from 6:30 p.m.-8 p.m. on Thursday, Dec. 16 at EMU’s Student Center, Room 310 A & B. The ECA@EMU program gives students an opportunity to earn college credits while still in high school and offers strong, academically focused students a chance to enroll in advanced, college-level coursework. The ECA@EMU public school district partners including: Ann Arbor, Chelsea, Lincoln, Milan, Whitmore Lake, Willow Run and Ypsilanti. The program is being coordinated through the Washtenaw Intermediate School District. Students who live in Washtenaw County or a county contiguous to Washtenaw County and are currently in the 9th or 10th grade in any public school district, charter, or home school, are eligible to enroll for the 2011-12 academic year. Details: www.earlycollegealliance.org or call (734) 487-4290. UPDATED: The Tdap clinic scheduled for Dec. 13 has been rescheduled to tomorrow, Tuesday, Dec. 14 at Huron – 2:30-5:30 p.m. Please enter through the administration doors and signs will be posted for the location. Huron High School will host a Tdap (tetanus, diphtheria, pertussis) and flu shot clinic on Monday, Dec. 13 from 2:30-5:30 p.m. in the Career and Resource Center, 2727 Fuller Road for anyone age 11 and older. The CDC has recommended that all adults and children over age 10 have a one time Tdap if they haven’t had a Tetanus shot in the past two years. The following insurances are accepted with no co-pays: Blue Cross & Blue Shield of Michigan PPO; Blue Preferred PPO; Blue Care Network; Priority Health PPO; and Priority Health HMO. If paying out-of-pocket the cost for the Tdap is $60 (normally $103) and flu $25. AAPS Adult Education’s GED Preparation program has open enrollment and registration is ongoing every Monday when school is in session) from 4-6 p.m. in Room 206 at Stone School. The registration process includes assessment and takes a full two hours. Classes are free but registrants must be at least 18 years old to enroll. Wines Elementary School teacher Jackie Ross did her first Writer’s Celebration project on Nov. 3 with her fourth-graders. During the event, students shared their writing with parents. Forty-two students in seventh-, eighth- and ninth-grade singers from the Ann Arbor Public Schools were selected to participate in the Michigan School Vocal Music Association State JH/MS Honors Choir. They were chosen by singing in small ensembles, one on a part, a required audition piece at the Regional site in October. These 42 singers are now working on learning their new repertoire, rehearsing with the other State singers first in Midland, then in Holland, and a third time in Saline. On Jan. 22 they will have their final rehearsal with their State Honors Directors, and then perform in the DeVos Center Concert Hall as part of the Annual Michigan Music Conference. Vocal music teacher Bonnie Kidd will be the SSA Honors Choir director. Community High School students raised more than $4,469 for Food Gatherers this fall. This is the second year that Community High has raised funds for Food Gatherers; the two-year total donation from the school is more than $10,000, according to information from the school. A study of the United States cities with the most brainpower placed Ann Arbor No. 2, with only Boulder, Colo ranking higher The study looked at the education levels of the residents from the 200 largest metropolitan areas. Washington D.C., home to thousands of federal employees, lobbying organizations and major law firms, ranked third..
“There is a strong correlation between education levels and quality of life as Boulder, Fort Collins and Ann Arbor all ranked high on our most educated and best mid-size places to live studies,” said said G. Scott Thomas, a demographer who participated in the analyses for Portfolio.com. The study used data from the American Community Survey, which was conducted in 2009 and released in September 2010 by the U.S. Census Bureau. It established scores for five levels of educational attainment, based on the relative earning power of adult workers (age 25 or older). Scores were determined by comparing the 2007 median income for all workers ($33,452) with the median income for those workers at a specified educational level. Portfolio.com is a national business news site published by American City Business Journals, a unit of Advance Publications Inc., whose parent company operates AnnArbor.com. Barnes & Noble has launched its first “My Favorite Teacher Contest” to give students an opportunity to share their appreciation for their teachers. “Barnes & Noble has been working on this concept for several years,” said Gayle Townsend, community relations manager. “We schedule Educator Appreciation Weeks in our stores three times per year, but have really wanted to recognize individual teachers at a national level as part of our Appreciation Week program. K-12 teachers are eligible for nomination. Students can nominate their teachers by writing essays, poems or thank you letters that explain how their life has been influenced. Awards will be broken down locally as well as regionally and include cash prizes for both teachers and schools and NOOK eBook Readers. Students who write winning recommendations will receive a certificate of recognition. Winning teachers from Ann Arbor will be entered in a regional contest, where six winners will be chosen. Barnes & Noble will select the National Teacher of the Year from the regional winners, and they will receive $5,000 as well as the title “My Favorite Teacher.” The winning teacher’s school will also receive $5,000 and an event with a well-known author. Students who want to participate should submit essays or poems to Gayle Townsend, community relations manager at Barnes & Noble, 3235 Washtenaw Avenue, Ann Arbor, MI 48104 by the Mar. 18, 2011 deadline. Details: HYPERLINK “http://www.bn.com/myfavoriteteacher” www.bn.com/myfavoriteteacher. The Ann Arbor Public Schools middle school student delegation visited Hikone, Japan from Nov.1-13, when the 12 members visited and stayed in the homes of Japanese students and attended school with them..
One thousand of the cranes were made by Leslie Lawther’s Ann Arbor Open Focus Studies classes and the other 1,000 cranes were made by members of the 2010 Ann Arbor student delegation. The Hikone Exchange Program was also recently awarded a grant for $2,000 from the Japan Business Society of Detroit Foundation. A team of 40 students from the Forsythe Middle School Knowledge Master Open Club came in first of 11 teams in Michigan when they competed on Dec. 7. Nationally, the Viking Auks placed in the top 1 percent, as they were No. 5 of 543 teams in the country. The Forsyteh score was 1,666 out of a perfect 2,000, compared to the state average score of 1,301 and the national average of 1,189. Forsythe also placed first in the nation in schools with more than 500 students. A team from Tappan Middle School finished fifth in the state, with a score of 1,370. 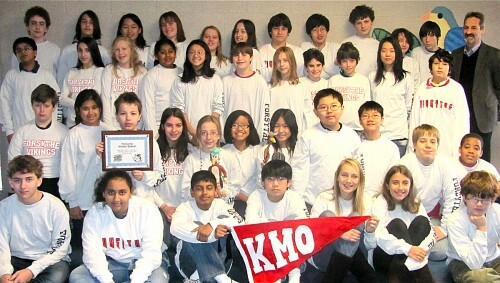 KMO is an academic competition that tests teams’ ability to answer questions in all the subject areas quickly and accurately. The Forsythe KMO Club meets every Tuesday after school in teacher Dan Ezekiel’s room and is open to all students in all grades. The next competition is in January and will be for sixth-graders only. Members of the Forsythe Middle School KMO Club.